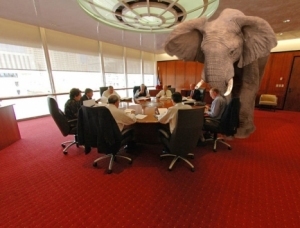 To paraphrase Wikipedia – An “Elephant in the room” has become a management saying meaning an obvious truth that is being ignored or goes unaddressed. It applies to an obvious problem or risk no one wants to discuss and based on the idea that an elephant in a room would be impossible to overlook; thus, people in the room who pretend the elephant is not there have chosen to concern themselves with tangential or small and irrelevant issues rather than deal with the looming big one. I don’t know whether it’s because elephants are now protected by law or not, but I’m coming across many more of them than I used to! Tackling the difficult topics in business life is hard, really hard, especially if you’re not used to having these sorts of conversations. You can choose to ignore difficult conversations and still survive in business and many do! If you’re thinking, yep that’s me, then I’d advise you to think again. If you want to be the best you can be, then you absolutely need to read on. If not, this post is not for you. I see two distinct types of Elephant in my line of work…and two ways of tackling them. The Management Elephant and the Leadership Elephant. This blog will focus on the former. The Management Elephant tends to be when you have a member of your team that is exhibiting behaviours that are not what they need to be. I was going to write ‘behaviours that are not acceptable’, but therein lies the fundamental problem. Because these behaviours are often ignored, because the conversations that need to happen to change the behaviours are hard, and therefore don’t happen, makes the behaviours acceptable….that bit is your fault! You owe it to your company, yourself and, if you want to be a good manager, your employee to have these conversations. Whatever the conversation, don’t just turn up to the meeting without preparing, especially if you are angry about the situation. NEVER lose your temper. Believe me, YOU will feel worse about it afterwards, not them. Think about as many of the potential reactions and outcomes as you possibly think of and prepare your response. These sorts of conversations can often lead to the recipient being upset. Respect their privacy and ensure that the meetings are conducted in private and that they can exit the meeting into a safe environment. Indirect and Sensitive – Have you thought at all how you interact with others? Direct and Sensitive – Working with other departments is key to our success. I received feedback that others are having difficulty working with you and we need to explore how to improve these relationships. Depending on the issue being addressed, there could be a whole range of consequences from mild to serious. The fact you are trying to tackle the issue means that this is at least important to you and your relationship. Many larger businesses have policies for capability / competence / performance etc and obviously there are potential legal ramifications for other more serious offences such as harassment or bullying. Obviously if you are having the conversation early enough and in the right way, you can hopefully sort the problem before any of these consequences are invoked. The key here is for you to convey the seriousness of the issue and what may happen if the behaviours are not altered. Ensure that you work with your employee on an action plan to rectify the behaviour and ensure this is time-bound and you have one or more follow-up conversations to ensure the issue is resolved. If it isn’t in a timely manner then you start to apply the consequences outlined above. For some people, unacceptable behaviours may have been tolerated by previous management or they may be completely unaware on the impact their behaviour is having on others or the organisation. As a good manager you have an obligation to help them through the process and if you don’t feel equipped to deal with the situation, take advice from peers or a Human Resources expert (internally or externally). Obviously if someone is breaking the law or in serious breach of their employment contract, then serious consequences must be considered and invoked immediately.